Here in this definitive compendium—the only cookbook devoted solely to the glories of the Italian bean cuisine. You’ll find more than 120 easy-to-prepare, authentic favorites featuring fagioli, including antipasti and salads, soups and stews, polentas and pastas, and a wide range of meat, poultry, and seafood dishes. Discover the delights of fagioli in all their delicious variety and versatility. 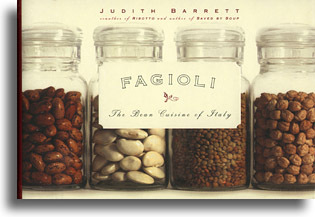 Fagioli, the first cookbook devoted to the bean cuisine of Italy, takes you on a savory journey to the best minestrone you’ve ever tasted and far beyond—from the earthy comfort of Piemontese Braised Veal with Borlotti and Vegetables to the elegant simplicity of Salad of White Beans, Shrimp, and Tomato. You’re sure to fall in love with fagioli at every stop along the way. A full-color photographic key identifying various Italian beans. It’s time for everyone to fall in love with fagioli, and with these marvelous recipes, that love affair is about to begin.